Teacher's 'Ready To Drink' beverages launched in Mumbai. Focuses on youth. Beam Inc., a leading global spirits company, has decided to launch Teacher’s ready to drink (RTD), a Scotch based beverage in a can to extend the Teacher’s brand among the youth brigade. The RTD will be available in two variants pre-mixed with two of the most common mixers – Teacher’s & Soda and Teacher’s & Cola. Teacher’s RTD is being launched in the Indian market soon after the successful launch of Teacher’s 25 Year Old Blended Scotch Whisky and Teacher’s Highland Single Malt. With this Teacher’s hopes to have a complete end-to-end Scotch portfolio in the region targeting different segments of Scotch aspiring consumers in India. 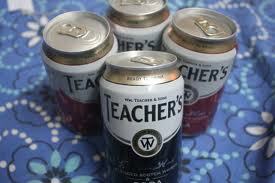 “Teacher’s RTD is positioned as an alternative to beer. We want to target young consumers who are starting out but aspire to drink a premium product. It is a day drink, low on alcohol. We want to say a whisky based RTD can also be refreshing and cool,” Harish Moolchandani, CEO & managing director of Beam India said.